#1 natural healthcare clinic in West Des Moines, IA! Ballenger Chiropractic is seeking to best serve each individual that comes into the clinic. Professionally termed a Chiropractic clinic, we are truly a Christian based family all working towards a common goal of physically, spiritually and emotionally serving our patients. This is why as you step foot into our clinic for the first time you will hear uplifting Christian music and be greeted with a loving smile and Hello. As a small local business, we are seeking to develop authentic relationships with each and every patient while utilizing our God-given talents and knowledge to the best of our ability. We are big believers in bringing out the best in everyone, this goes for staff AND patients. Through the course of each year, Ballenger Chiropractic supports many in-need families in the Des Moines area. This is where YOU come in! We encourage our patients to partner alongside us to support these families and organizations. In this way, we strive to be leaders in not only the chiropractic expertise, but through the avenue of showing love as Christ did. So it is through your support, that we can support many others! Voted as West Des Moines’s Best Chiropractor 2017! Travis was born and raised here in the Des Moines area. He was involved in numerous sports throughout high school, which is when his passion for an active and healthy lifestyle began. He attended Iowa State University in Ames, Iowa where he received his Bachelor’s Degree in Kinesiology and Health. Throughout his undergraduate studies he worked as a personal trainer and completed a semester long internship in the Cardiac and Pulmonary Rehabilitation program at Mercy Medical Center. During this experience he assisted patients in their journey back to full health by leading them through exercises, and educating them on the importance of staying active to maintain a healthy lifestyle. He extends his passion for health into the general population as he has gained hundreds of hours of experience working one on one with clients and patients. Travis recently attained his CA/CT Certification through Parker University. He seeks to educate patients on how to gain and maintain a pain free lifestyle through the use of functional exercises both in and outside of the clinic in addition to Chiropractic care. Dr. Luke is originally from Pella, Iowa. He attended the University of Northern Iowa, Central College, and Logan University to obtain his various degrees and specialties (see below). Dr. Luke is a firm believer in using a whole body approach (Thinking Well, Eating Well, Moving Well) in healing and maintaining health. As an athlete himself, Dr. Luke specializes in the treatment of competitive athletes, as well as weekend warriors. He also treats a wide variety of other ailments (see below) through the use of chiropractic, acupuncture, therapy/rehab, and nutritional supplementation. Dr. Luke has a strong passion for education and is also a highly sought-after speaker in the natural healthcare field. Dr. Kim is originally from Hampton, Iowa. She received her various degrees from the University of Northern Iowa and Palmer College (Davenport, IA). While at Palmer, she had the privilege of participating in an internship with a local chiropractic clinic where she found her passion in caring for pregnant & pediatric patients. Dr. Kim is licensed in Acupuncture and utilizes a variety of adjusting techniques including manual adjusting (more aggressive techniques) as well as Activator and SOT adjusting (less aggressive techniques. She believes in the whole body approach to wellness and just as each patient’s condition is different, so is their treatment. Dr. Alex is originally from Kansas City, KS. She received her various degrees at Kansas State University and Logan University. Dr. Alex has a very gentle approach to her treatment methods, as she’s mastered a variety of treatment techniques (see below) that are very comfortable, safe and effective for men, women and children of all ages. Dr. Alex’s mission is to create an environment that is warm, educational, and always welcoming. Dr. Alex specializes in the treatment of chronic disorders, including: pain, hormonal imbalances, digestive disorders, skin conditions, immune challenges, nerve conditions, auto-immune disorders, and much more. Dr. Alex has a strong passion for the treatment of females and children. She excels at treating infertility and hormonal issues, through the use of chiropractic, acupuncture, and nutrition. Dr. Dyce is originally from Aurelia, IA. He received his degrees from Simpson College (Indianola, IA) and Palmer College of Chiropractic (Davenport, IA). During his time at Palmer, Dr. Dyce found his passion for working with Athletes, pregnancy, geriatrics, and basically anything with a spine! Dr. Dyce views the body as a whole organism which cannot be broken down into individual parts or systems. This is why Dr. Dyce uses many different techniques in order to be as specific as possible with each patient he encounters on each visit. Extensive training in nutritional supplementation through the use of whole food vitamins and herbal supplements. We pride ourselves on being a natural healthcare clinic that successfully treats a wide variety of conditions through Chiropractic, Acupuncture, Nutrition, Exercise Physiotherapy, Whole Food Supplements, and Herbs. 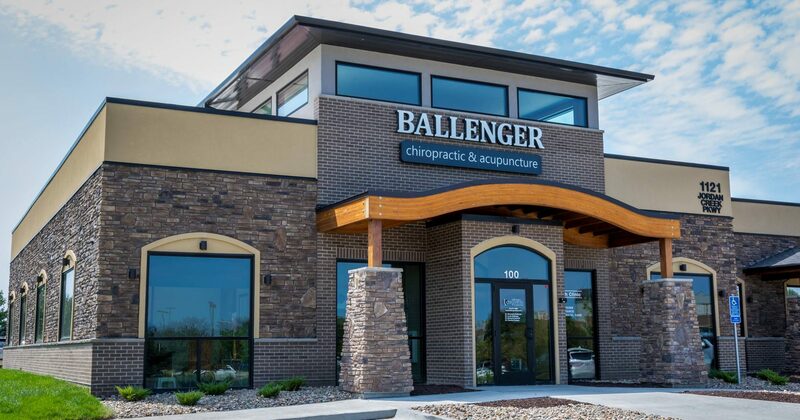 Ballenger Chiropractic & Acupuncture is a comprehensive facility ready to serve the healthcare needs of you and your family. Doctors Luke & Alex Ballenger established the clinic in 2010, and have focused on the needs of their patients every day since through a holistic approach. We pride ourselves on being a natural healthcare clinic that successfully treats a wide variety of conditions through Chiropractic, Acupuncture and Nutrition. It is the policy of Ballenger Chiropractic to help our patients realize their total health potential by maintaining wellness. We strive to provide an atmosphere that will recognize and nurture each patient’s individuality and beliefs.